The best FLV Video Converter for Mac allows you to pick up any part of your FLV video to convert and also merge several FLV videos into one output file. You can also crop the video to get rid of the black edges or choose your own play region and also choose the aspect ratio for your output video. You are allowed to set the exact value of your output video's settings like video bitrate, frame rate, resolution and audio channels to set for conversion. 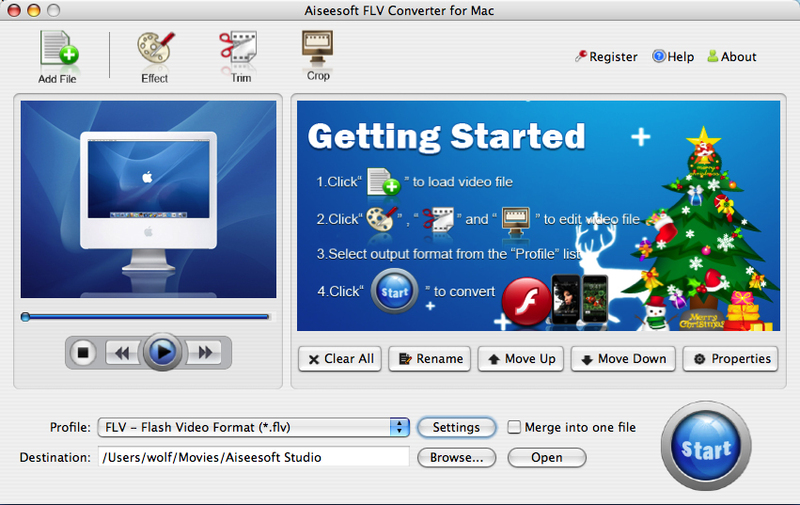 Aiseesoft FLV Converter for Mac can convert FLV video to all the popular video formats, including AVI, MP4, MP3, MOV, MKV, WMV, DivX, XviD, MPEG-1/2, 3GP, 3G2, VOB and so on. Qweas is providing links to Aiseesoft FLV Converter for Mac 3.1.08 as a courtesy, and makes no representations regarding Aiseesoft FLV Converter for Mac or any other applications or any information related thereto. Any questions, complaints or claims regarding this application Aiseesoft FLV Converter for Mac 3.1.08 must be directed to the appropriate software vendor. You may click the publisher link of Aiseesoft FLV Converter for Mac on the top of this page to get more details about the vendor.